In the 1960s and 1970s, three huge dams were built in British Columbia to hold back the flow of the Columbia River. The entire Northwest still benefits from their construction. B.C. reservoirs release water at strategic times, boosting the amount of cheap electricity generated at U.S. dams. The reservoirs’ storage capacity also protects U.S. cities from flooding. 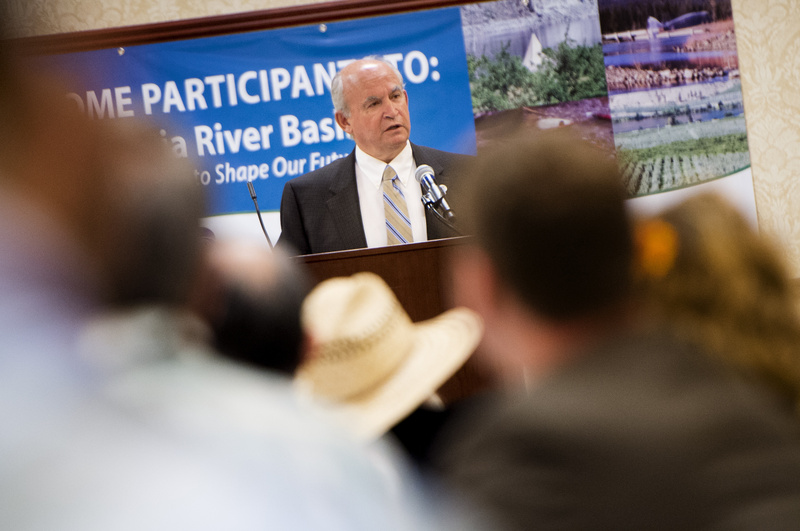 The dams were built as a result of the 1964 Columbia River Treaty between the U.S. and Canada, which is lauded worldwide as a model for cooperative management of water resources, said Bill Bennett, B.C.’s minister of Energy and Mines. But as the two countries embark on efforts to revise the 50-year-old treaty, the B.C. government is looking for a better accounting of the benefits Americans get from the vast amounts of water stored north of the border, Bennett said. In addition to electricity and flood control, Canadian reservoirs provide water for Northwest salmon in dry years and help fill U.S. reservoirs for recreation, irrigation and navigation, he said. Those benefits haven’t been fully accounted for in the past, he said. Bennett, whose agency is developing Canada’s treaty position, was the keynote speaker Wednesday at a Columbia River conference in Spokane. More than 300 scientists, policymakers, and members of U.S. tribes and Canada’s First Nations attended the conference, which concludes today. But how the U.S. compensates Canada for water storage is a potential sticking point in future treaty negotiations. Northwest utilities want to lower treaty payments to British Columbia for operating the large storage dams in the Columbia’s headwaters. The payments send about $200 million worth of electricity to Canada each year, though the countries even disagree on how much the electricity is worth. Some U.S. interests argue that Canada is getting overpaid based on an outdated formula. “There’s a lot of money at stake on both sides of the border,” Bennett acknowledged during his talk. Building the Canadian dams came at a cost still felt today, Bennett and other speakers told audience members. Hundreds of families were displaced when the dams went in and valleys were flooded. Farms were lost, along with archeological sites important to First Nations. The B.C. reservoirs can fluctuate by as much as 155 feet to prevent flooding in downstream communities. That leaves some B.C. residents living along vast mudflats during parts of the year. Restoring salmon above Grand Coulee Dam also generated discussion at the conference. Both U.S. tribes and First Nations in Canada support the return of salmon and steelhead to the upper Columbia Basin. They’re pushing for the inclusion of salmon restoration in the revised treaty. The Columbia River had record salmon runs this year, but indigenous people in the upper basin were left out in experiencing that bounty, said Matt Wynne, a council member for the Spokane Tribe. Salmon were once so abundant in the Spokane River below the falls that the water was “black and silver with salmon,” he said. British Columbia does not support adding salmon restoration to the treaty, Bennett told the audience. Grand Coulee was built without fish ladders in the 1930s, so “salmon stopped swimming up the Columbia River long before the treaty,” he said. Adding salmon restoration to treaty talks could bog down negotiations for years, Bennett said. But that doesn’t mean that the two nations couldn’t address salmon through other means, he said.